New Study Says Florida is Relatively Safe for Older Drivers | Robert W. Elton, P.L. Baby boomers make up a significant portion of the population not just in Florida, but in the rest of the United States. Some even refer to the surge of baby boomers, those approaching retirement, as the ‘Silver Tsunami’. It looks like in some states, being an older driver makes you more likely to be critically injured or even killed in a car accident. 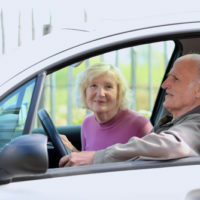 A recent research study conducted by Caring.com indicates that there are 10 safe states for older drivers and 10 dangerous states for older drivers. Surprisingly, Rhode Island, the country’s smallest state by geography, has the highest threat for senior drivers. According to the AAA Foundation for Traffic Safety, individuals aged 65 and older are expected to make up a quarter of all drivers by 2025. This number may be even higher in Florida which is popular for snowbirds and individuals entering retirement. In order to determine these outcomes, the National Highway Traffic Safety Administration analyzed residents in each state aged 65 and above who were killed in car accidents with the number of older individuals living within the state. In addition, the study explored the relationship between road rules, driver related fatalities, and the percentage of older individuals in the state. The research project also identified the driving rules for seniors and discovered a relationship between rules and vehicle related deaths. States that have stricter rules for senior drivers including vision tests, in-person testing and more frequent renewal requirements were associated with fewer senior vehicle accident fatalities. States with less strict rules or no rules at all, however, had higher numbers of senior fatalities. For example, there are no driving rules for seniors in six of the most dangerous states. A further 19 states had no restrictions on older drivers at all. Older drivers may sustain critical injuries if involved in a vehicle crash. An older driver who already suffers from a chronic medical condition may find that it is more difficult for him or her to recover from a serious traffic accident and surgical or other treatments may not be recommended as a result of their existing health conditions. A vehicle accident crash involving an older driver can derail retirement plans and make it more difficult for that individual to fully recover and enjoy his or her life. Family members may also be challenged when an elderly loved one gets hurt in a crash. This can necessitate not just a hospital stay, but perhaps even a nursing home stay or the need for someone to be with the loved one around the clock. Family members then have to make difficult decisions about how to pay for this care or whether someone within the family will be able to step up and handle it. To put it simply, a car accident involving an older individual generates a lot of problems. This is why personal injury law allows those hurt by someone else’s negligence to file a lawsuit. Showing how the accident hurt the victim may be the first step in recovering compensation for serious injuries. If you are an older driver who has recently been involved in an accident with a driver who was negligent or reckless behind the wheel, you may have recourse to recover compensation via a personal injury lawsuit. Never minimize the impact that a potential car accident can have on your life. Instead you should consult with a knowledgeable Florida car accident attorney immediately to determine whether or not your case meets the guidelines for filing a personal injury lawsuit. What is Comparative Fault in an Auto Accident in Florida?